Johnnie Walker Platinum Label Blended Scotch Whisky is a popular Whisky available from Amazon.co.uk in 70cl to buy online. Visit Amazon.co.uk for the best price for 70cl of Johnnie Walker Platinum Label Blended Scotch Whisky or compare prices on our other Whisky products. A subtly smoky blend that personifies Johnnie Walker with opulent, dark and vivacious taste that honours those who take the time to enjoyed it. Stewed fruit, malty cereal, velvety vanilla, fragrant almonds and tangerines give this whisky, fruity and sweet flavour that allows for a mildly dry, gentle and smokey finish. 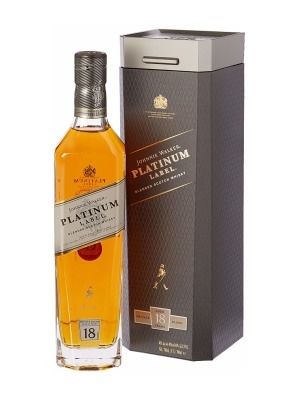 Where to buy Johnnie Walker Platinum Label Blended Scotch Whisky ? Johnnie Walker Platinum Label Blended Scotch Whisky Supermarkets & Stockists. You can buy Johnnie Walker Platinum Label Blended Scotch Whisky online in most retailers and find it in the Whisky aisle in supermarkets but we found the best deals online for Johnnie Walker Platinum Label Blended Scotch Whisky in Amazon.co.uk, DrinkSupermarket.com, and others. Compare the current price of Johnnie Walker Platinum Label Blended Scotch Whisky in 70cl size in the table of offers below. Simply click on the button to order Johnnie Walker Platinum Label Blended Scotch Whisky online now.